Iterators can be looked at like pointers. They reference an item in a data structure( including string ). They can also be used with streams. The iterators enables us to iterate through them using various operations like ++. But we need different types of iterators because data structures can often be iterated in different ways. Some ways are efficient on some containers while they might be inefficient or even impossible on other containers. Let’s take a look at the different type of iterators. The properties of the various iterators here are the bare minimum of the “pure” version of the iterators. Some implementations might support more operations. Note that forward iterator, bidirectional iterator and random access iterator does not implement output iterators. This means that they can’t, by definition, write to the object they refer to. We’ll get back to this later. Let’s start by looking at the first type of iterator, output iterator. As mentioned earlier, output iterator is a very limited type of iterator it is also the only iterator that can write to the object. You can’t go back with an output iterator, and you can’t iterate over the same range twice. And there is no guarantee that you can write to the same position twice without incrementing the operator. And you can’t compare two output iteratrs either. What you’re basically doing is writing into a “black hole”; you’re just writing and you can’t see what you have written. Most iterators, though implement output iterators but also has other traits that enables more functionality. We’ll look at these later. cout is of the type ostream. You also have an iterator to this type, called ostream_iterator that can be set to an ostream Writing to this iterator writes to the ostream it’s an iterator to. // Create an ostream_iterator to std::cout. The ostream_iterators are output iterators. Using cout like this shows how output iterators works ; you can only write and the writing has to be sequential. You can newer go back. Once you’ve written something, you can’t “go back” and write something in the position before what you just wrote. In the previous example, we saw that ostream_iterators are output iteratorss. Which means we can use them to write to cout. Similar to this, we have istream_iterators that are input operators. And where we can use ostream_iterators with cout, we can use istream_iterators with cin which reads input. Since we’ve specified int as the template argument of the input_iterator, the input_iterator ( intReader ) will become the same as invalid, which in C++ means the iterator will point to the element past the end element. This is the same as readerEnd and the loop will terminate. If you take a look at the iterator overview above, you’ll see that the forward iterator implements input iterator. This means a forward iterator can do anything an output iterator can do. With output iterators or input iterators we would have to read or write in between each time we iterate forward. If we had used an output iterator or an input iterator to do the multiple iterations would have caused the iterators to become invalid. Finally, a forward iterator can iterate over the same range twice. Here we’ve effectively moved back and continued moving forward, which again would not be possible with code>output iterators or input iterators. As you can see, using forward iterators is in many ways more convenient than using output iterators or input iterators, but some object only has very few operations, like the streams we looked at earlier. A linked list is a container that works a bit different from the array-like containers. Basically, each element has a pointer to the next element. So that all the elements are chained together using pointers. If you want to go from one element to another, you use the next pointer. This can mean a lot of operations if the list is very large. The objects will not be one contiguous piece of memory like arrays are. This means there are no quick ways to go from the first to the last element. So if we wanted to go from Node 1 to Node 2 in the above illustration, we would have to go via Node 3. And if we wanted to go back from Node 3 to Node 1 we would have a problem. There is no pointer that goes back in a forward list. If you want to get to a previous node, you would need a pointer to an earlier element. The forard_list itself keeps a pointer to the first element in order to be able to access all elements. A container in like this didn’t exist in C++ until C++11 which has the container forward list. The forward list is a great way of showing how the forward iterators works. The forward list can only be iterated forward and the forward iterator can only iterate forwards. We are now at the fifth element ( 5 ), but say we want to print the previous element ( 0 )? We need to go back to the begin element and increment like above. Per definition, forward iterators does not include the properties of output iterators. The bidirectional iterator is very similar to forward iterator. The only different is that it also supports backwards iteration. And that’s all the difference between code>forward iterator and bidirectional iterator. In the forward iterator section we looked at singly linked lists which has a pointer to the next element. But most linked lists also has a pointer to the previous element.These are called doubly linked lists or simply just linked list. The container type doubly linked lists are identical to singly linked lists, with the one exception that each Node now has a pointer to the previous Node too. The prev pointer enables us to iterate backwards, so now we need an iterator that can iterate backwards and forwards. This is where the bidirectional iterator comes in. The following example is the similar to the example for forward list but this time we solve the last problem in a different way. We are now at the fifth element, but say we wanted to go back to the previous element? Since doubly linked lists support bidirectional iterators, we can use -- to iterate back. As you can see, bidirectional iterators can iterate back and forth without problems. 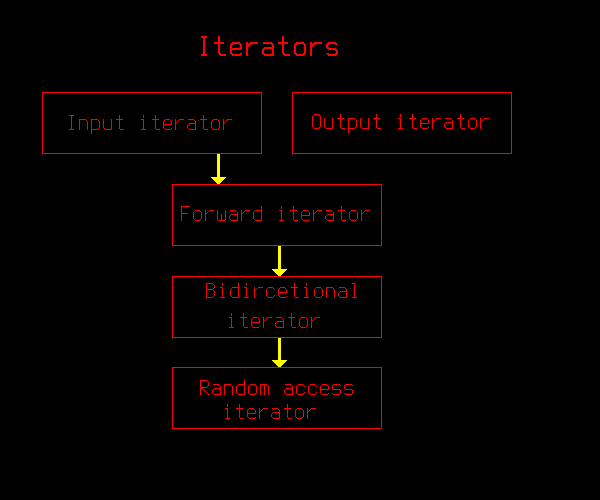 Now let’s look at the final iterator, random access iterator. The final iterator is also the one with the most features. It can be used like a pointer. In fact, some implementations of STL uses pointers as random access iterators. Array like containers are all containers that are organized as a continuous piece of memory. This means you can predict where the next item is, since it the next item will always be the previous item + the size of each item. Using this knowledge, it’s easy to jump forward or backwards. An example of these containers is vector, which I covered in a previous part. The above example shows how any array-like container ( vector, array, queue, deque, … ) is laid out in memory. Everything is in one continuous block which means we always know where the next element is. There are several types of iterators in C++. Especially random-acces iterators can be particularly useful. We will see more of this in the next post. The next part will also introduce a few new iterators, but they are all variations of the iterators in this post.